Alkor Technologies - manufacturer of full range of infrared windows for spectroscopy, thermography, pyrometry and other LWIR, MWIR, SWIR applications. IR Windows are ideal for use in FTIR spectroscopy, in addition to thermal imaging, FLIR, or medical systems. Infrared Windows should be chosen based on the substrate’s mechanical or optical properties. Please do not hesitate to contact us for pricing for any custom size and coatings IR windows. Alkor Technologies design, manufacture infrared windows, IR optical components and blanks, polished or unpolished, coated or uncoated. Silicon is a material of choice for infrared optical windows in a variety of applications from infrared night vision to infrared thermal imaging systems. 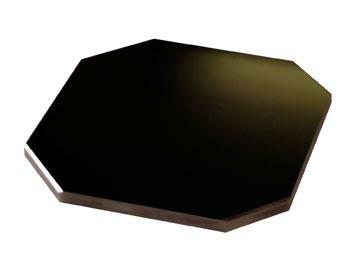 It is commonly used as a substrate material for infrared windows in the 1.2um-8um region. CVD ZnS is an infrared transmitting material with high performance and relatively low cost, which is often used in the 8 to 12 microns region. Its high resistance to rain erosion and high-speed dust and particulate abrasion makes it particularly suitable for exterior IR windows on aircraft frames. Calcium Fluoride can be used in the ultraviolet, visible and infrared spectral regions. It has excellent transmission in the ultraviolet range. Calcium Fluoride is often used in spectroscopic infrared windows and lenses due to its high transmittance from 150 nm to 9000 nm. Barium Fluoride windows can be used in the ultraviolet, visible and infrared spectral regions.